London Underground&apos;s lines of route have evolved from a series of originally private underground electric railways since the late 1800s, and in 1933 were nationalised into a central body, the London Passenger Transport Board. From this point on, the LPTB and all successive bodies have sought to find the best way to indicate the relationship that all the tube&apos;s routes have with one another. A young draughtsman, Harry Beck, designed in 1931 a diagrammatic route finder using straight lines and 45 degree angles joined with smooth elbow curves. This method of representing the tube network was revolutionary and was an instant success. Many existing websites chart the development of the diagram adequately so I won&apos;t repeat them here, and would invite you to to see some of those. However, as stated by the author Maxwell J. Roberts in his book , those in charge of updating the diagram are faced with increasing challenges and constraints in keeping the map not only complete in its depiction of all new and existing lines and their extensions, but also keep the map user-friendly and simple to follow. It is difficult to see how the two can go hand in hand, as upon each revision distortion of the lines is necessary to bring the interchange and crossover points snugly into line. 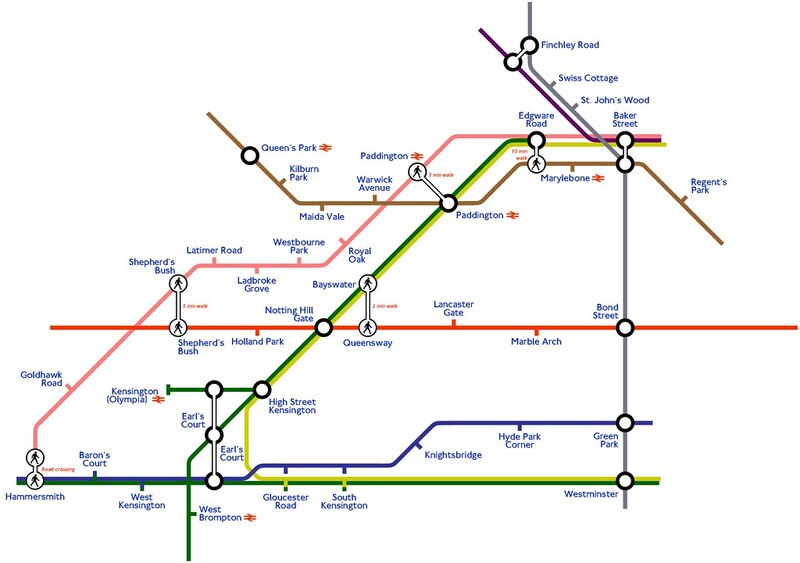 Although the Tube Map is highly regarded as a clear and successful exercise in information design and presentation, some criticisms are levelled at it, particularly where oddities in the way lines join (or appear to join) appear either simpler than they really are, or more complicated than they really are, on the map. For instance, some stations are within easy walking distance from each other - just a couple of minutes. By stark contrast, some station names actually refer to two (and sometimes three) DIFFERENT station buildings, yet on the map these appear to occupy the same building. Paddington and Edgware Road are good examples. On the actual map, these stations appear twice and out of relation to each other. Nearby Queensway and Bayswater stations are actually CLOSER TOGETHER than each pair of stations with the names Paddington and Edgware Road! I had begun an attempt to redraft the entire tube map to try and resolve these anomolies - but to be honest, others got there first and did better than go in the direction I had started to go in - Alex Gollner providing my favourite alternative interpretation. Click here to see his blog.